You can use any pasta you like, but I prefer orecchiette (little ears in Italian) because the sauce pools within the pasta and you get a little sauce with every bite. For an extra health benefit look for a whole wheat/grain version. Also, you can use any type of squash that holds up well to roasting. Preheat oven to 450 degrees and toss squash with a little olive oil, salt and pepper and roast for about 15 minutes (tossing once) until tender and golden brown. Remove sheet pan from oven and set aside. In a large saute pan, add olive oil, leeks, garlic, thyme and sage and cook on medium-low for about 5 minutes until leeks are tender, stirring frequently to prevent garlic from burning. Deglaze with white wine or brandy and cook for a couple of minutes until alcohol has reduced. Turn heat up to medium and add vegetable stock and cook until stock has reduced by half about 15 minutes. Add cream and cook until lightly thickened about 5 minutes longer. Season with salt and pepper to taste and set aside. Bring a large pot of salted water to a boil and cook pasta until al dente. Drain pasta, rinse well under water, and drain well again. 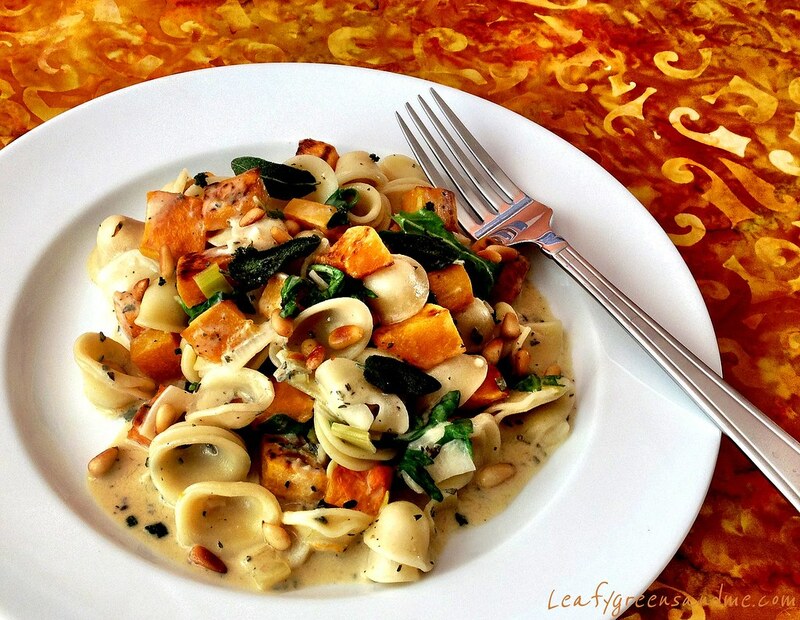 Start off by adding 3/4 of the cooked pasta to the pan, along with roasted butternut squash and arugula and toss to heat through. Depending on how much sauce you have, add the remaining cooked pasta--you may need to add a little more vegetable stock if sauce is too thick. Serve immediately garnished with toasted pine nuts and fried sage leaves and a squeeze of fresh lemon juice. Drain cashews and add to a blender. Add filtered water and blend on high for about 4 minutes (with ear plugs...:-) until creamy. Strain cream and set aside. You'll need 1 cup for this recipe. Use any remaining cream in your morning coffee. Heat a small saute pan on medium heat, add sage and cook for about 1 minute, turning once until darkened and crispy. Remove from pan and place on a paper towel.